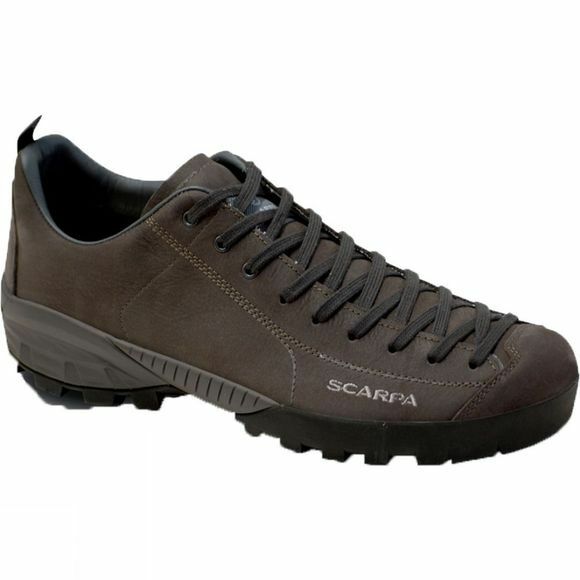 Enjoy comfort and performance with this lightweight, stylish shoe from Scarpa that blends a love for everything outdoors with vibrant street style. Taking design elements from Scarpa's popular climbing shoes, the Men's Mojito City GTX Shoe not only looks great, but also grabs hold of the track for spontaneous adventures. A durable Vibram Spyder Arctic sole unit provides stability on rocky terrain and trails, while the anti-shock midsole cushions and protects your foot. A rubber toe rand prevents damage to the soft suede uppers from scuffs and scrapes. With a unique, fitted shape and laces these shoes are designed to make a statement. Whether you are out with friends in town or on your way to the next crag, slip into your Mojitos and get into the spirit of adventure.